This proposal is part of the collaborative project proposal prepared for submission to SOTOYAMA Initiative, United Nation’s University, Institute of Advanced Studies (UNU-IAS), Japan. Nepal has prepared the Biodiversity Strategy (2002) and its Implementation Plan (2006-2010). These documents are in draft form, which are being reviewed by local consultant. It is expected that the review will provide a strong foundation and basis for revision of the national biodiversity strategy and action plans. NBSAP will also include a general framework for LBSAP, but will be primarily focused at district level. 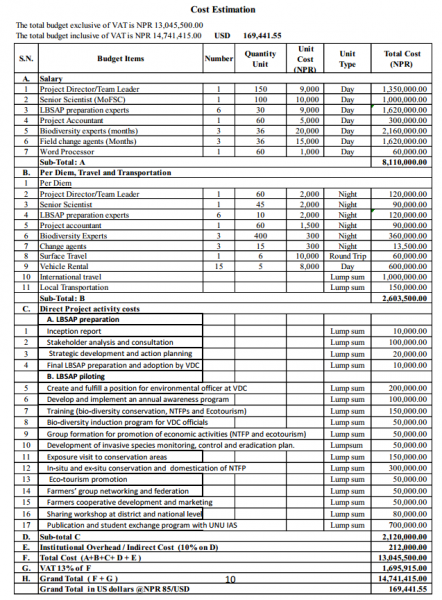 In the mean time, this proposal is intended to prepare general framework for LBSAP to be based at the smallest administrative unit, the Village Development Committee (VDC). Based on the framework, piloting of the LBSAP activities will be done in three VDCs, one each ecological region (Terai/Inner Terai, middle hills and high hills). These VDCs include Saktikhor VDC of Chitwan district, Kusadevi VDC of Kavre district and Syapru VDC of Rasuwa district, which fall in Inner Terai, Middle hill and High hill region, respectively. The main goal of LBSAP is to support the respective VDCs to develop a sustainable plan through the integration of effective administration, biodiversity conservation and maintenance of environmental goods and services, development planning and growth of the local economy. The duration of the LBSAP will be of 10 year period and it includes broad strategies and specific actions that the respective VDC will implement in a bid to conserve and enhance its biodiversity. Community appreciation and active participation in the conservation of VDC level biodiversity. Enhanced human well being and poverty reduction through the mainstreaming of biodiversity conservation into the local economy. 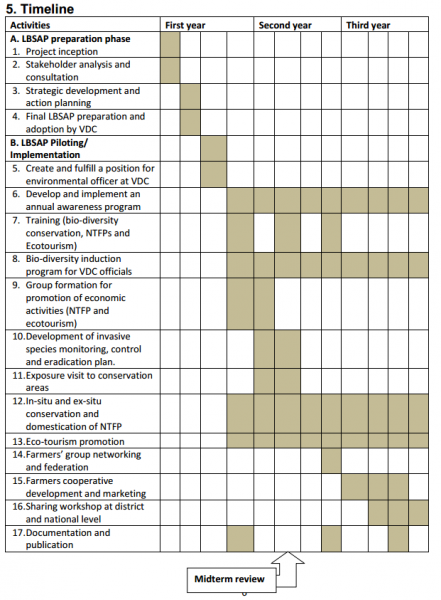 The LBSAP will establish the foundation for the long term integration of biodiversity considerations into all aspects of the institution and its governance practices. The LBSAP will facilitate legal compliance. 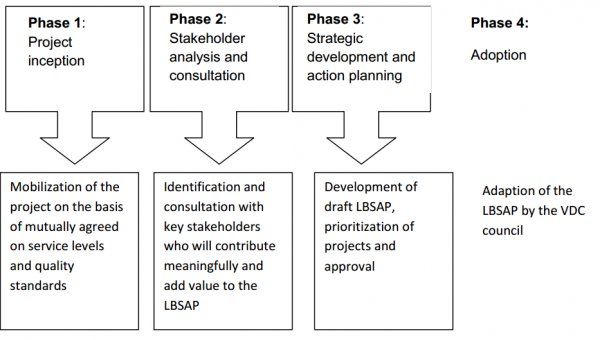 The LBSAP development process includes four phases as depicted in Figure 1. Identify partnership opportunities that the VDC can make use of to promote the conservation of biodiversity. Mainstreaming biodiversity into local economic development. Under this, the potential economic activities such as NTFP domestication and eco-tourism activities will be identified. The possible project activities to be implemented in the next three years are listed below: However, this activity list can be changed based on local consultation. Develop and implement an annual awareness programme. Farmers will be provided with necessary skills and training required for biodiversity conservation and other economic activities related program (NTFP, ecotourism). Biodiversity induction program for VDC officials and ward committee members. The LBSAP will be included in existing 5 year VDC periodic plan and or will be reviewed on an annual basis together with the periodic plan. The projects will be included in the Service Delivery Budget Implementation Plans (SDBIP’s) of the VDC official and secretary and progress will be reviewed by the VDC Council on a quarterly basis. The LBSAP will be informed by various legislation and policy frameworks including the Constitution, international legislation, national legislation, national policies, provincial legislation, provincial policies, district policies and local policies. KAFCOL has been working in all three districts (Rasuwa, Kavre and Chitwan) for the last half a decade with support of various local organizations and national organizations including Nepal Agroforestry Foundation, Action Aid Nepal, World Education, and various local groups. A strong community base or foundation has been established in these areas. These organizations have already collected a huge amount of saving as a village bank, which could be used for borrowing money for NTFP processing and marketing. Meeting held with local communities revealed that all communities are very much willing to work in this project. Besides, VDCs and district line agencies, particularly District Forest Office, respective conservation areas and National Park and District Soil Conservation Office, will be fully cooperating with the project to implement the proposed activities under direction of the Ministry of Forests and Soil Conservation (MFSC). 1. Preparation of LBSAP: A team of 6 members comprised of various backgrounds (including terrestrial biodiversity-agriculture and forestry, aquatic biodiversity, NRM/ environmental laws, gender and social inclusion, and GIS and Remote Sensing) will be constituted at KAFCOL. This will help in preparation of LBSAP. This team will be supported by the scientists of Ministry of Forests and Soil Conservation (MOFSC). This phase will be completed in 6 months of the first year. 2. Implementation/piloting of LBSAP: A core team of nine members will be involved in the LBSAP implementation. The implementation will be done in three phases. The first phase will last for 3 years as discussed earlier. The implementation of second and third phase will be the responsibility of the concerned VDC officials. Overall implementation responsibility will be vested on KAFCOL with technical backstopping from the Ministry of Forests and Soil Conservation, Nepal. The UNU- Institute of Advanced Studies, Japan will provide both technical and financial support to execute the project. A 9 member team led by a professor of the Kathmandu Forestry College (KAFCOL) with PhD degree in Agroforestry and Rural Development with background in LBSAP and biodiversity conservation and use will run the project. This team will be technically backstopped by a senior scientist from the MOFSC with PhD degree in Forestry and Environment Science including background in bio-diversity conservation and NTFP. The Team Leader (TL) and Senior Scientist from the MFSC will visit the site and provide overall guidance to the team on a regular basis. One professor or faculty from UNU-IAS will visit Nepal during the first year of the project implementation and provide his/her feedback to the project team. Of the rest 7 members of the team, three forestry and environment graduates (one each per site) and three field change agents (one each site) will be based in the field. The rest one will be looking after the financial aspect of the project. He or she will be frequently visiting the field from KAFCOL. The three forestry graduates/ scholar will help in documenting both aquatic and terrestrial biodiversity resources in the project area and will make sure that each of the identified species is registered in the respective VDC. Forestry officers will coordinate the field activities in close coordination with TL. He/ She will keep his/her field team abreast of information. He/she will be responsible in coordinating with VDC, district line agencies and other relevant organizations involved in biodiversity conservation and overall monitoring of the project. The three forestry experts are responsible to provide trainings at field level. The Field Change Agents will help to follow up of the field program, organize group meetings and exposure visits and keep abreast of information and disseminate information to farmers. Farmers are given the topmost priority during the implementation of the activities from planning to end of the activity. Of the 9 persons listed under human resource section, six staff will be stationed in the district with frequent visit in Kathmandu and will make regular follow up and monitoring of the project activities in their respective sites. The process documentation will be done by each of these experts according to their professional discipline. The process documentation report will be submitted to all three collaborating partners. All the processes and activities mentioned earlier will be monitored on a regular basis. On-going monitoring and follow up will be done by partner institutions including MoFSC and KAFCOL. The program will be monitored and evaluated by a joint team of all stakeholders at the end of the third year program of the project implementation. This activity will be conducted at crop maturity stage and media persons also participate in the program. Evaluation will analyse the shortcomings and strengths of the project and this will be a guideline for further improvement in the rest of the implementation period (4th-10th years) to be carried out by the VDC itself. The draft report will be sent to UNU-IAS and MOFSC, Nepal at the end of the first quarter. The annual report of the project submitted to UNU-IAS will prove the project outputs regularly. Follow up will be done quite frequently by the Implementing agencies and collaborating organizations. This report will serve a means of verification. In sixth quarters (i.e. one and half years period), a mid-term evaluation will be done to see whether the project is on track or in line with the objectives of the project. This will be done jointly by MFSC and KAFCOL. A report will be produced by the evaluation team including one member from District line agency for further improvement of the project. The team will consist entirely from outside. Final report covers all the outputs and achievements as well as recommendations for further improvements of similar kinds of projects. The documentary film will show the impact and success story of the group and will be the source of encouragements for farmers’ as well as all technicians working in the same field.